The holidays are a time of celebration, when many take the opportunity to open special bottles of wine for family and friends. Champagne is an easy choice with which to start the festivities. Bringing an evening to a close is another matter: Consider finishing your holiday meal with a slice of creamy, heavily-spiced pumpkin pie paired elegantly with a rare and magical glass of late-harvest dessert wine tasting of honeysuckle, caramel and crème brûlée. What makes a dessert wine so special? In the wine world, there are basically two kinds of sweet wines, sometimes also called "stickies," because picking the grapes makes the workers' hands sticky. Of the two, port is the most famous and widely consumed dessert wine and is produced by adding brandy or a neutral spirit to a wine and stopping its fermentation before all the sugars are converted to alcohol. The other, "late-harvest" wines, are exactly what their name implies: a winemaker lets the clusters hang on the vines until the grapes start to turn into raisins, which increases the sugar levels, making a sweeter wine. Aside from the methods used to make Vin Santo, an Italian dessert wine originally from Tuscany, and Vin de Paille from France, there is another — far more complicated and mysterious — way of producing dessert wine. 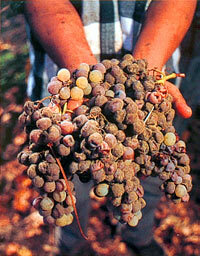 Botrytis cinerea, roughly translated as "noble rot," is a fungus that infects the grapes. It eats its way below the skin, attacking the fruit inside, turning it into horrible looking, moldy clusters, but also concentrating the sugars and solids. One of the most famous dessert wines in the world (Château d'Yquem) is made from these rotted grapes and hails from Bordeaux, France. Such Sauterne wines are produced from moldy Semillon and Sauvignon Blanc grapes, and new vintages can easily command $200 and $300 price tags. Well-preserved vintage bottles have been known to sell for tens of thousands of dollars. But few know that the same style of wine is produced all over the world and that botrytis-affected wines from California are beginning to rival their European cousins in quality and price. Dolce, possibly the most distributed botrytis-affected wine coming out of the New World, was inspired by Sauterne. In 1986, Dirk Hampson, Director of Winemaking, was looking to supplement the Far Niente line of Chardonnay and Cabernet Sauvignon offerings and wasn't sure how to get started. He was trying to create something seemingly impossible, because you can't ensure that the grapes get infected with the spores and become rotten. The bottom line is that Mother Nature is always in charge and there is no guarantee that the wine can even be made every year. 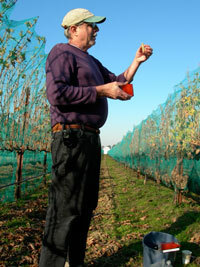 In the beginning, they experimented with spraying the vines with water in hopes of getting the grapes to rot. At one point, they isolated botrytis in the lab and re-applied it to the grapes while they were still hanging in the vineyard. That particular year, the botrytis was sprayed on one entire block while the block next to it was left alone. The block that had no botrytis applied to it ultimately had more and better rot. In the vineyard, 95 percent of the fruit can be eaten by wasps and only 5 percent of what is grown actually makes the ultimate wine. This explains much of the wine's rarity. Specially-trained vineyard crews are taught the difference in mold colors; good molds are pink, purple, gray and blue while bad molds are red and green. The vineyard crews have to very slowly pick the clusters and then, using needle nose pliers, separate the grapes by the rot color. A worker can spend a full minute on each cluster and still be left with nothing of value. Unlike the rainy Bordeaux region where Sauterne is made, California typically gets much more sunshine, which can actually make it harder to get the grapes to rot. 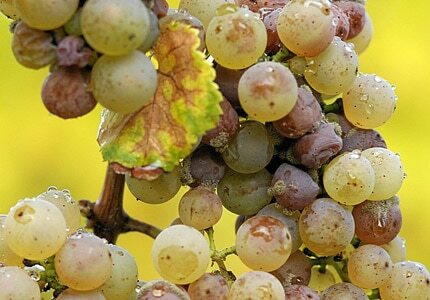 The noble rot grows better in damp, cloudy areas, and because California is so sunny, there are only a handful of vineyards that are geographically desirable to help the grapes produce the mold. Fortunately for Dolce, there is no longer the need to experiment with spores. Hampson has successfully been able to create a wine exceptional enough for almost twenty years, and Dolce now has a winemaker, Greg Allen, devoted solely to the project. Pioneered by Alice and Myron Nightingale in the 1950s, Beringer's offering is a proprietary process of producing a botrytis-affected wine entirely in the laboratory. Myron passed away in 1988, but Alice, wanting the process to continue, taught it to Roger Harrison in 1990. She kept an eye on the process, and Beringer has continued to make this wine ever since, honoring the Nightingales by the naming the wine after Myron and Alice. During the spring and summer months, while the grapes are growing on the vines, Harrison is in his laboratory, creating mold spores. When the grapes are picked in the fall, they are placed on trays, sprayed with the mold and placed in a specially-constructed 50'x50' building where the temperature and humidity are controlled to 68 degrees. They start with 100 percent humidity, misting the grapes for 33 hours. Then they remove the tarps and the botrytis attacks the fruit. It sends out the mycilla, feeding on the sugar and acids in the grapes, piercing the fruit. Fans are turned on to get air flow between the stacked trays of grapes and the grapes begin to dehydrate. The fourteen-day process shrivels up the grapes and concentrates the juice turning ten tons of harvested grapes into six tons of wine-worthy grapes. The subsequent wine will spend several years in oak barrels, mellowing and aging before its release. Richard Arrowood learned to make late-harvest wines when he was the winemaker at Chateau St. Jean, teaching the vineyard workers that the rot found on the grapes was good and to leave it alone. Also teaching them how to pick the grapes, Arrowood went so far as to bring some wine into the vineyards to explain to the pickers how the rot creates the sweet wine. When he started his own winery in 1990, he took his passion for botrytis-affected wines with him. Unlike the classic Sauterne-style, Arrowood's botrytis offering has German roots and is produced from White Riesling grapes instead of the Semillon/Sauvignon Blanc blend. Despite harvesting from two different vineyards, there are still only a few hundred cases produced at Arrowood, and it does not happen every year. Following the German designation of sugar levels, Arrowood will have up to three dessert wines every year — a late harvest, a select late harvest and a special select late harvest — with only the latter being a fully botrytised wine. These designations are based on brix, or the sugar levels of the grapes when they are harvested. In many ways, Topaz owner and winemaker Jeff Sowells is the hidden angel of botrytised wines. Jeff got his start in the Napa Valley back in the early '80s as a cellar rat at Silverado Vineyards. A few winemaking classes later, he and Jon Engelskirger (now winemaker at Robert Pepi) started a partnership with an old mail truck as a makeshift bottling line and mobile winery known as Zymurgy. Sowells started to learn and experiment with making wines from infected Sauvignon Blanc fruit in 1986 while helping at Macauley Vineyards in Calistoga. His own Topaz label was created in 1988 when Ann Watson, owner of Macauley Vineyards, was tragically killed in an auto accident and no one knew what to do with the winery's rotten grapes. Having created good wine for Macauley just a few years earlier, Jeff purchased the grapes from the vineyard and bottled it under his own label for the first time. The name “topaz” has many meanings for Jeff. Yes, it is the color of the wine and epitomizes the golden tincture of the unctuous fluid, but it is also the birthstone for November, the month of Jeff's birthday, and the month that the grapes are usually harvested. Always looking for potential rot, he often has had to convince an owner to sell him rotten fruit. This gives him an advantage of obtaining fruit that growers think is bad (but have yet to just give away) and still be able to produce his wine. He has a good, stable crew that knows what he is looking for in rotten fruit. They will pick whole clusters and separate out the rot later. He pays his workers double because it is such laborious work. Sowells figures it evens out, considering he is paying less for the actual fruit. "Almost spiritual how it happened. There has to be a divine plan. I'm a humble guy, yet through this bizarre amount of rotten fruit, I can create this divine wine." The acid and sweetness in the wine perfectly balance the rich fattiness in those foods. With that in mind, we did a little experimentation and discovered that the rich creaminess and dark, earthy flavors of pumpkin pie is another great pairing that will make your holidays that much more special.